Anonymous sale, Sotheby's London, 23 February 1990, lot 77. Two pairs of mahogany armchairs of this model were sold anonymously, Sotheby's London, 9 July 1993, lots 148 and 149. 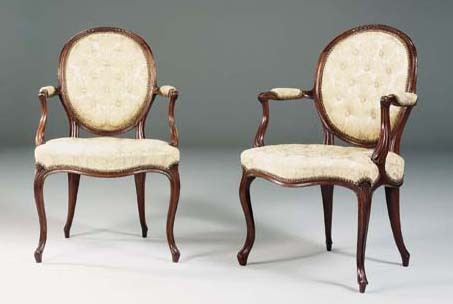 A further pair of armchairs were sold anonymously, Sotheby's London, 6-9 May 1988, lot 89 (£13,200 inc. prem.). A closely related chair is illustrated in M. Harris & Sons, The English Chair, London, 1946, p. 143.